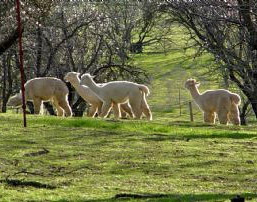 Derwydd Alpacas is an alpaca farm located in Esparto, California owned by Jan & Dale Davis. Whether you are new to the alpacas business or an experienced breeder, call or e-mail Derwydd Alpacas today, to find out how the Derwydd art of breeding the finest alpacas can help you paint success into your alpaca business. 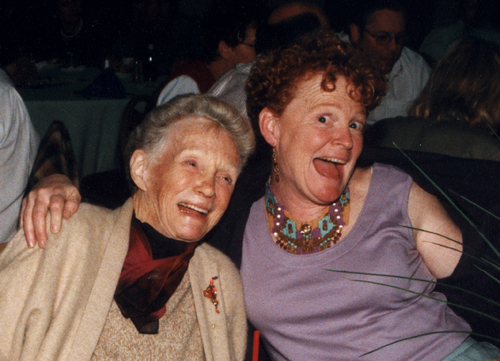 Jan & Dale - we are fun folks! At Derwydd Alpacas, we have fifty acres of gently rolling hills, nestled in California’s Capay Valley, just west of Sacramento. 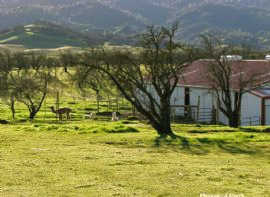 Jan Davis, with the help of her daughter, Dale, raise 50 alpacas on a ranch that is also home to an almond orchard. 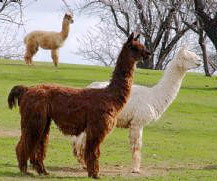 Breeding alpacas and a passion for the alpaca industry are the primary focus on the ranch. For the past fifteen years, Jan has been raising alpacas and has become known as an owner who strives to breed alpacas of superior quality fiber and soundness, and a tireless supporter of the alpaca industry. The Derwydd herd includes 20 exceptional, full Peruvian dams (both Suri and Huacaya), fourteen herdsires, 7 Huacaya and 7 Suri, with a heavy emphasis on Accoyo, currently active in the breeding program. We partner with a number of great farms in our herdsires AND some of the dams! Green Valley Alpacas, Crescent Moon Ranch, Accoyo America, Alpacas of EL Dorado, Alpacas at Lone Ranch, Alpacas del Oeste, Alpacas of Washoe Valley, Alpacas All Around, Alpacas of Marin, Chelsea Farm and SoCal Suri Alpacas! Even with this small number of topflight herdsires and prize-winning females in the herd, Jan & Dale have been able to breed a variety of color, outstanding conformation, and award-wining fiber into the crias born on the ranch. With a number of color champions at all show levels, Derwydd crias are demonstrating Jan’s vision. Jan prides herself in being honest, ethical, and willing to help her customers and other breeders succeed. With sincere passion, she believes in the Derwydd Alpacas tag line, “Where Breeding is an Art,” and she feels breeding for superior fiber should be drawn into every owner’s breeding program. Jan wants to have fun in this business – and in life. At a vibrant, young 88 years of age, she’s a role model for breeders who not only want to fully enjoy the true benefits of raising alpacas, but who want to promote the success of the entire alpaca industry. Jan loves the alpaca industry and wants others to share its benefits.